In mid-March, a late winter storm dumped inches of rain on frozen soil in the Midwest, flooding the Missouri River and tributaries—particularly in agriculture-intensive Iowa, eastern Nebraska, and western Illinois. The storm has submerged farm fields under water, washed-out roads and bridges, caused grain silos to burst from flood damage, and drowned livestock. Many farmers may be unable to plant their fields in time this year, or even at all. But soil experts looking at that same damage will notice another thing: erosion of precious topsoil. This first layer of soil is the key to the Midwest’s immense fertility and agricultural strength, but a resource that is slow to rebuild after major losses like farms are currently experiencing. Mahdi Al-Kaisi, a soil scientist at Iowa State University, explains why erosion is bad news for farmers, and how the damage from this flood event could ripple for years to come. 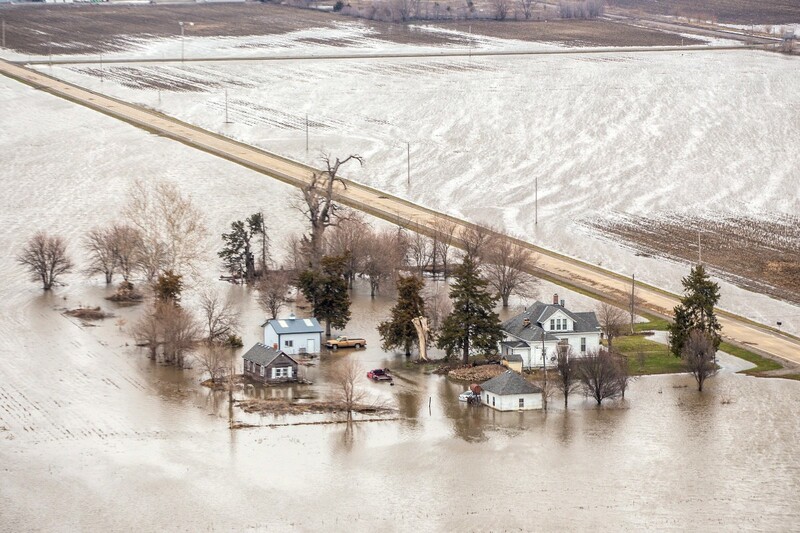 *Editor’s Note: This post has been updated on 4/9/2019 with a more recent photo of the flooding in farm fields in Iowa. Read more about the flooding farmers are facing in the Midwest on Earther. Learn more about how these floods are affecting the soils on Midwest farms from Mother Jones. Find out more about different management considerations for post-flooding soils from Iowa State University. Mahdi Al-Kaisi is a Professor of Soil Management and Environment at Iowa State University. IRA FLATOW: This is Science Friday. I’m Ira Flatow. You have probably seen the photos from the recent historic floods in the Midwest. Farms under feet of water, broken grain silos spilling out of last year’s harvest, drowned pigs, roads washed out, lives ruined. As farmers in Nebraska, Iowa, Illinois, and other states start to dry out and assess the damage, one big factor will be the dirt left behind– the soil that was washed away by the water. And I’m talking about the topsoil– rich in organic matter, and the key to the incredible fertility of Midwestern fields. Mahdi Al-Kaisi is professor of Soil Management and Environment at Iowa State University in Ames. He’s here to discuss it with me. Welcome to Science Friday. MAHDI AL-KAISI: Thanks for having me, Ira. IRA FLATOW: You’ve been in Iowa, one of the states hit hardest by the floods last month. What does it look like out there now? MAHDI AL-KAISI: There is significant damage to agriculture and commercial properties and infrastructure on the east side of the state, by the Mississippi River, also on the western side, by the Missouri, where there is approximately 145,000 acres covered with water, flooded, compared to 2011, about 127,000. So there is significant damage to agriculture, business, and farmland. IRA FLATOW: Well, let’s talk about the farmland. Let’s talk about a flooded farm. What happens to the topsoil there? How do you assess whether the topsoil has been eroded or lost? MAHDI AL-KAISI: Generally, when you have significant amount of water running off from rivers and streams, it’s going to carry a significant amount of the topsoil. And as you mentioned earlier, topsoil is the most productive part of this whole system to support crop production, growth, and animal production, and so on. So these sediments and these soils rich, with organic matter and nutrient, won’t be carried to lakes and rivers, and basically is going to create a lot of environmental problems, clean up, and loss of productivity in the short term and the long term. IRA FLATOW: Is there any way to measure how much loss of the topsoil there was? MAHDI AL-KAISI: Generally, in the research, what we do– that basically there is a setting you set, rain simulator on the field, and the flumes to collect the amount of sediments that run off with the different rain intensity. And basically, you could extrapolate from that measurement into the watershed or on the field. As you have a larger scale and big landscape, it’s going to be very difficult to assess how much soil was lost. But there’s going to be a significant amount of losses, given the amount of volume of water flooded by the Missouri, where proximately 11 million acre foot of water runoff [INAUDIBLE] cover these areas, comparing to, historically, about 7.3 million acre feet in 1952. MAHDI AL-KAISI: So that give you perspective. IRA FLATOW: Yeah. Is there anything farmers can do to make up for the loss? Can they add the organic matter back or can they put the microbiome back? MAHDI AL-KAISI: It definitely is going to be a lot of work. It’s going to be physical, biological, and chemical damage to the flooded soil. And what the farmers could do, actually, after the flooding recede and the ground is workable, there are several issues they can work on. And basically, they have to have some plan grown on these flooded soils, especially now we are doing the growing season and the planting season. And some of the fields, maybe they cannot get to it. But leaving the soil bare is going to basically compromise the microbial community and this whole system. So what we are recommending to the farmers, even if they couldn’t plant the whole season, they need to put some crops, whether cover a crop or any crop to grow, because some of these fungi basically live on the soil system, and recycling the nutrients to become available to the plants for production. IRA FLATOW: So you wanted– so you’re saying a cover crop will actually get the microbiome that was lost or drowned in the soil to regrow? MAHDI AL-KAISI: Exactly. Because they need a medium to live on, and especially the mycorrhiza fungi, it’s critical to live on the colonized root system. And they have a symbiotic relationship between [INAUDIBLE] system, [INAUDIBLE] the carbohydrates at the same time, recycling nutrients, especially phosphorous, from the organic form into mineral form to become available to the plants. So having living plants in the solar system is going to be very healthy to rejuvenate and compensate, or mitigate, the losses of these microbial communities due to the flooding condition. IRA FLATOW: –and gone someplace else and deposited. MAHDI AL-KAISI: Right. And especially when you look at the eastern part of Nebraska, for example, there is a lot– sandy soils are deposited on the areas. And there is a different degree of deposit. If you have a small amount, the farmers could work it out in the soil system when the soil condition dry. But if you have a huge amount accumulated on the surface, that’s going to require some structural changes and some sand removal to bring this all back to its original condition so it’ll be farmable and you could plant the crops on these soils. So that’s going to be a lot of work, a lot of expense associated with managing these soils physically and chemically, as well. IRA FLATOW: And are we then talking about a lost year in productivity for some of these farmers as they work? To get the soil back, they’re not going to be planting their crop? It may be too late? The soil may be too watery? MAHDI AL-KAISI: Exactly. You know, we are during the growing season now, especially the planting season, and the critical time is going to start mid April. And if you get close to May 20, May 15, every time there is a delay is going to be a decline in the productivity. So some of the areas may be not recovered till late May or June, so that will be a lost season to the farmers. So basically, what they’re going to do is just manage the field and work on it and prepare it for the next season, putting cover crop and trying to do soil testing in the upcoming season to make sure that there is enough nutrient data to add to the soil system and so on. IRA FLATOW: Given that we may be seeing more and more of these floods due to climate change, can farmers do anything to prepare for the next big flood? MAHDI AL-KAISI: There is a lot of management issue that’s associated with these unpredictable events due to climate change, and these are a good indicator– what we have, these extremes with the rain events and amount of snow we got, for example, here in Iowa. From January to March, we got almost 54 inches of snow accumulated. That’s equivalent to over 4 inches of water, and the soil could process approximately one to two inches. So the excess water is going to runoff. So if you have a system– for example, you use conservation practices, using [INAUDIBLE] or using cover crop– that’s going to build the soil system, build soil health, increase the soil storage capacity, increase the soil permeability. So when you have extreme events the excess water could be processed and moved into the soil system, reducing the surface runoff and prevent any potential erosion and sediment loss, are topsoil losses, to the streams and rivers. So there is a lot of practices that need to be implemented. It could mitigate some of these extreme events. IRA FLATOW: Well, that’s some terrific information, Dr. Al-Kaisi. Thank you for taking time to be with us today. MAHDI AL-KAISI: Thank you, Ira. I appreciate it. IRA FLATOW: Mahdi Al-Kaisi is professor of Soil Management and Environment at Iowa State University in Ames.